The loop antenna used for generating radiated magnetic fields is fully described in Figure 1A of MIL-STD-461A. It consists of ten turns of number 16 AWG wire on an insulated form 4.72" (12 cm) in diameter. The winding is placed on the form in a position which allows the form to be used as a spacer to place the winding 5 cm from the face of the item under test as required by Test Method RS01 of MIL-STD-462. 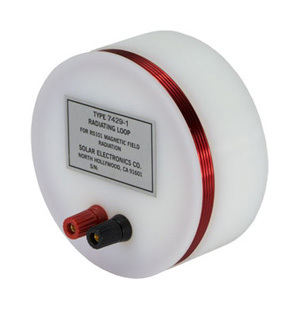 The Solar Type 7429-1 Loop Antenna has been designed to the exact requirements of the specification. The loop winding is placed on a durable plastic form and is equipped with banana jack style terminals for connection to the test setup. The loop is not shielded. 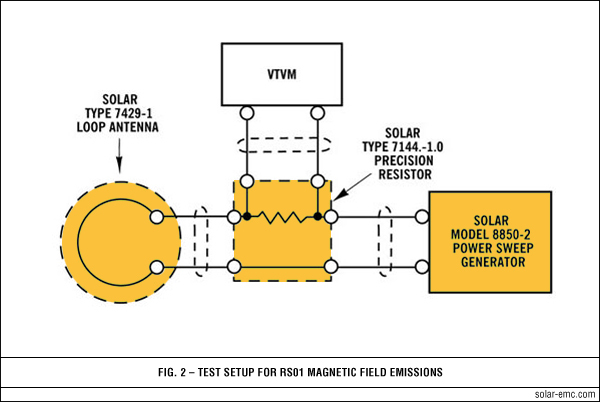 In a practical RS01 test setup, the loop antenna is supplied with the required current versus frequency by the Solar Model 8850-2 Power Sweep Generator. The current is measured with a voltmeter connected across the Solar Type 7144-1.0 Precision Resistor which is connected in series between the loop and the generator. 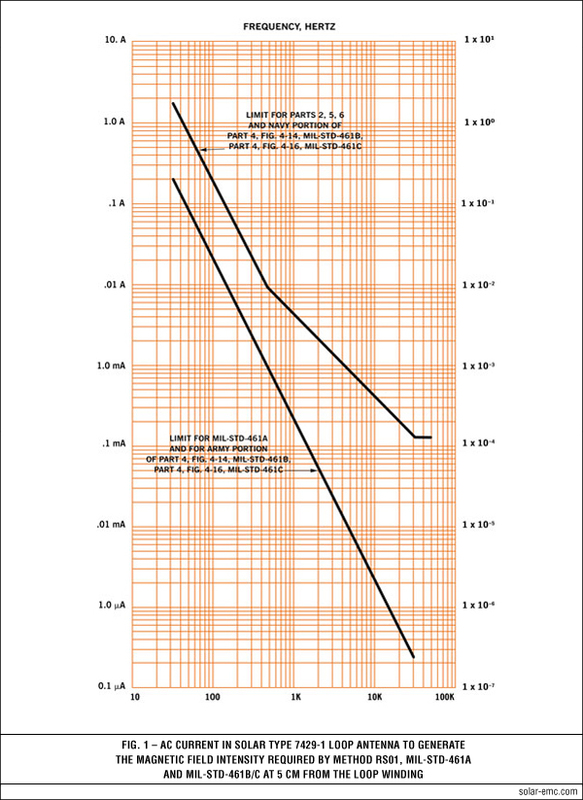 The AC current in the Type 7429-1 Loop Antenna togenerate the magnetic field intensity required by Test Method RS01 at 5 cm from the loop winding is depicted on a graph supplied with the loop. The required current varies from a few mA to about 5 A as frequency is adjusted over the range 30 Hz to 50 kHz.